Click here to visit the Matrix facebook and like them. Then on the “Biolage” tab, fill out the easy form and you’ll be entered to win 1 of 10 ipads. Also the first 10,000 people to enter will receive a free sample. Love this stuff! Can’t wait to get a sample. Matrix products make my hair more manageable. 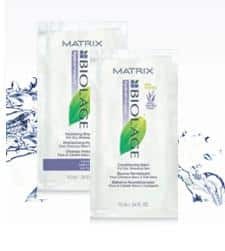 I like the manageability Matrix products give to my hard to manage hair. site is not working right now. whats up with the blank page? seems a shame that everyone HAS to join facebook to be elgible.. discrimination !!!!!!!!! Would not let me request because I do not have a mobile phone. Did not want to enter fake number. I love this product. Can’t wait for a free sample!